Am having a happy day today despite some fairly major problems at work but I’m sure it will all be sorted eventually thanks to my excellent colleague Julie. I am still on track to go part time from Monday so Friday will be my last day in this role which is very liberating – hello new me. Have now no idea where things will take me which is very strange as up until recently I had a very clear plan for most of the rest of my life but have decided that I like this fate thing in some ways. Bit scary but lots of positives. 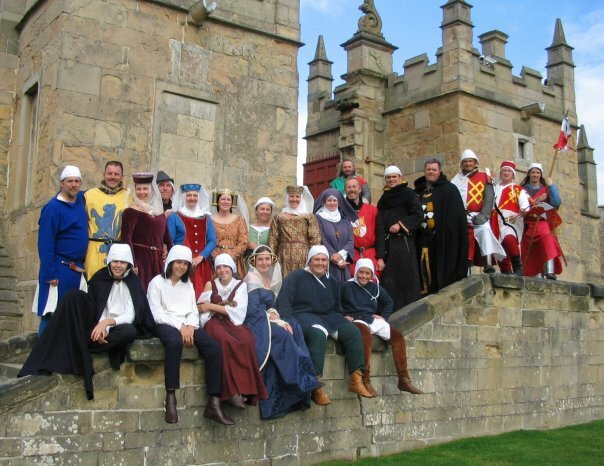 Excellent weekend which has put me in a very good mood – here is a pic of us all outside the little castle. Nearly all of the group are there – apologies to Luke who was absent . Don’t we all look lovely in our costumes! They really are the best bunch of people in the world and I am so lucky to have them all. We have such a laugh together and support each other and they are like a big extended family. I am starting to feel like some kind of normality is returning as we are now back at work and the kids are at school from next week – the holidays have been lovely but it is time to go back to real life. It’s going to be strange for all of us as there are big changes ahead – me and work and the whole embroidery business, Ellie with her A levels and moving away to University next year and Jake with starting his GCSEs. But they are so fab, strong, kind, caring and really good company. Hope that wherever you are you are having a happy day too – take care and be strong.